It was not so long ago that sequencing even tiny snippets of DNA was a costly, cumbersome process that required access to a state-the-art lab. Today, we are inching close to putting a DNA sequencer in every pocket. This week, a team of researchers from UCLA and Sweden announced that they have built a microscope that uses the camera in a smartphone to detect the fluorescent products of DNA sequencing reactions in cells and tissues. What that means is that a doctor could plug the mobile-optimized microscope into a smartphone and perform targeted DNA sequencing and molecular analysis on things like tumors, in places that lack well-equipped medical labs and hospitals. The new tool, in theory, could allow doctors to perform high-end cancer diagnostics just about anywhere. Yes, we know, this sounds a lot like Star Trek’s Tricorder. The researchers, who published their work Tuesday in Nature Communications, imagine that their technology could be a boon to the growing field of telemedicine—doing medicine remotely and away from a hospital setting. DNA sequencing and other molecular diagnostics are the gold standard today when it comes to diagnosing cancer accurately, an important first-step in eventually treating cancer. But in places without well-equipped labs, molecular diagnostics are often not available. The researchers hypothesized that mobile phones, with cameras that have already been shown to produce images matching the quality of high-end pathology microscopes, may be the answer. They designed and 3D-printed a light-weight optomechanical attachment to integrate into the existing camera of a Nokia Lumia 1020. The attachment contained, among other things, two tiny compact laser diodes for fluorescence imaging, and a white light-emitting diode for bright-field transmission imaging. Using the attachment, they were able to perform targeted DNA sequencing in colon cancer cell lines and human tumor samples. They then used a machine-learning-based algorithm to process the images to be used in cancer diagnosis. In theory, this method allows a doctor to gain a whole lot of information about a tumor without much more than a glass slide plate and a cellphone. “With their rapidly expanding imaging and sensing capabilities, computational power, and connectivity, mobile phones help translate biomedical measurements from lab environments to ... field settings,” the researchers wrote. Turning Star Trek’s Tricorder into reality, is, of course, a longstanding dream of modern medicine. In 2013, Google announced that it planned to literally make a Tricorder for cancer detection, promising to have a prototype ready in just six months. In 2014, the British company Oxford Nanopore Technologies released a USB-powered DNA sequencer the size of a matchbox. 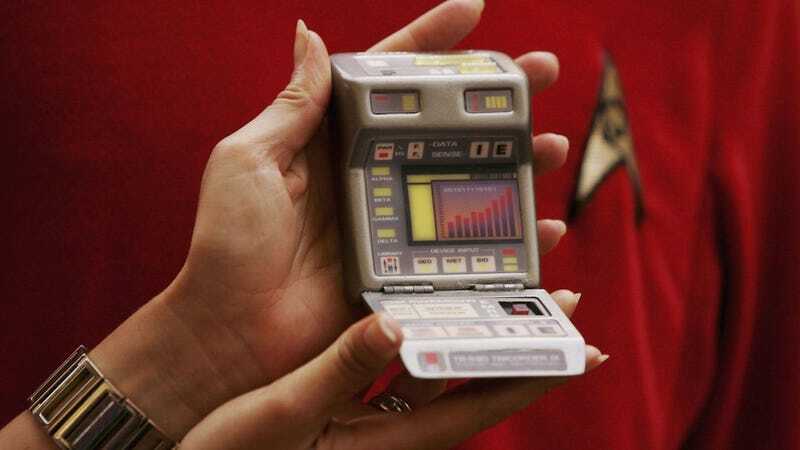 Google’s Tricorder, unsurprisingly, has still never materialized. And while Oxford Nanopore’s pocket sequencer has already been put to use in places like the International Space Station, it’s $500, requires specialized knowledge to operate, and is plagued by concerns about accuracy. This new smartphone microscope, the researchers noted, also leaves room for improvement. It still requires a lab technician to operate it, for one. The accuracy and sequencing depth could both be improved, too. But the work could well be an important first step in making molecular diagnostics for everything from cancer to infectious disease available to anyone with little more than a smartphone.